Bone is a remarkable connective tissue derived from hyaline cartilage whose matrix, under the influence of calciferol, has been hardened by the deposition calcium and phosphate to form hydroxyapatite ([Ca3 (PO4)2]·Ca(OH)2) as the ground substance. Collagen remains the primary fiber in the matrix as it is in hyaline cartilage. Special arrangements are made for supplying blood to this living tissue. The major supply comes from a vessel housed in the central canal, and cross linkage between central canals are provided by Volkmann’s canals. The matrix is maintained by osteocytes, the characteristic cells of bone. 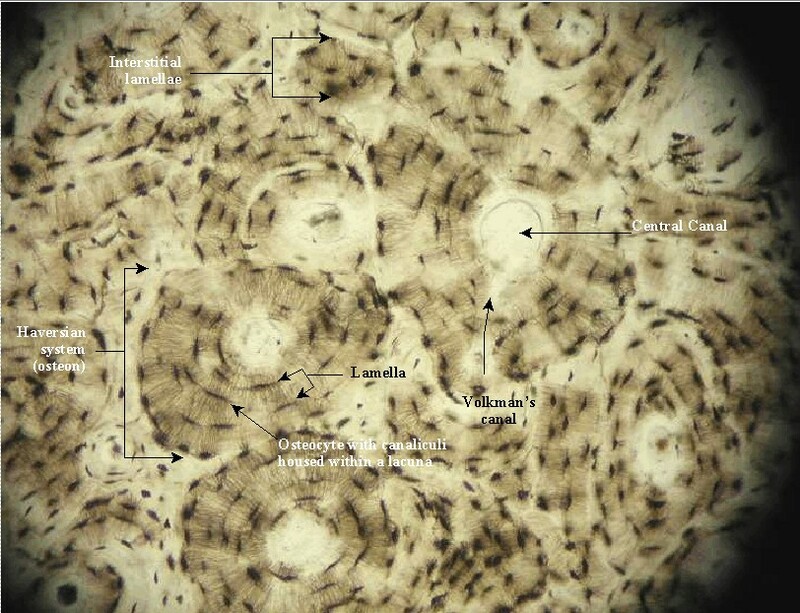 Histologically, bone is composed of units termed Haversian systems or osteons in which concentric rings of osteocytes are arranged around a central blood vessel. Make two illustrations, one an overview of a Haversian system (100x), the second a detailed view of an osteocyte (400x). canaliculi “little channels” containing protoplasmic extensions from osteocytes.